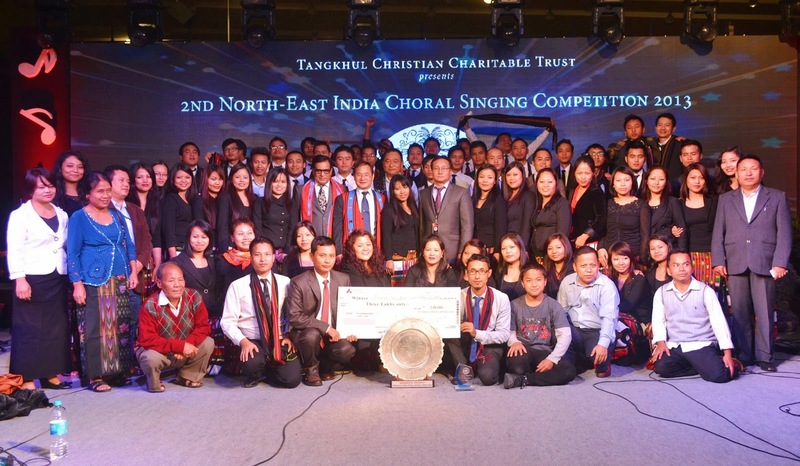 New Delhi, 10 November 2013: The Hmar Christian Fellowship Delhi (HCFD) Choir is winner of the 2nd Annual North-East India Choral Singing Competition, held at Thyagaraj Stadium, New Delhi this evening, taking away with them the prize money of Rs. 3 Lakhs. The Evangelical Baptist Convention Church (EBCC) Choir, who came in second, took home Rs. 2 Lakhs while the Poumai Baptist Church Choir bagged the Rs. 1 Lakh third prize. 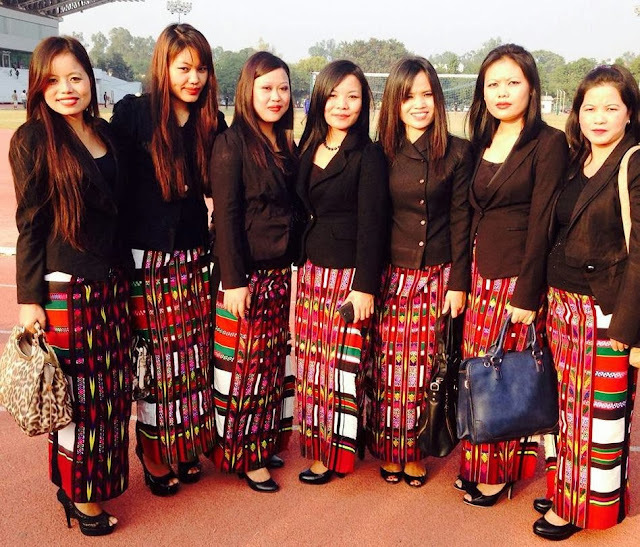 Started in 2012 and aptly themed 'TOGETHERNESS', this one-day socio-religious event is organised annually by the Tangkhul Christian Charitable Trust (TCCT) and draws participation from various North-Eastern community based fellowships and churches in the National Capital Region (NCR). 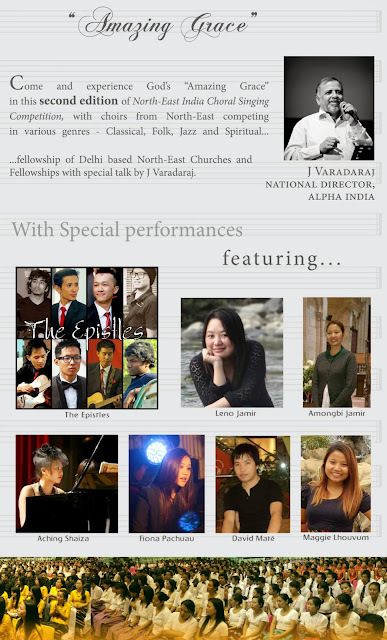 The event also serves to host a combine fellowship of the NE Christians in and around Delhi and to display musical talents and individual performances from different communities. This year's edition of the North-East India Choral Singing Competition saw participation from 13 choirs while an audience of over 4000 people clapped, cheered and praised God in the indoor stadium of Delhi's premier sports complex. Shri Nabam Tuki, Hon'ble CM of Arunachal Pradesh graced the occasion as chief guest and Shri U K Sangma, IAS, Secretary to Ministry of DoNER, Government of India was the guest of honour. The event also witnessed special performances from The Epistles, Leno Jamir, David Mate, Aching Shaiza, Amongbi Jamir, Fiona Pachuau, Maggie Lhouvum, the Ao Naga Baptist Church Choir and the Tangkhul Church Delhi (TDC) Choir. Renowned minister Mr. J Varadaraj, National Director, Alpha India presented a short talk. The competition song for the event 'Amazing Grace', a popular Christian hymn composed by John Newton, was beautifully performed by all participating Choirs and a panel of four judges from the US, Korea, Germany and Australia was entrusted with the difficult task of determining the winner. It should be pointed out that each team was allowed to make modifications and variations to the original tune of the song unlike last year's "God is Love" in which the tune and melody was pre-set by the organising committee. The 54 member choir of the Hmar Christian Fellowship Delhi was conducted by Mr. Francis Lalnunmawi Zote who also did the tune modification of the song for his team. The Hmar Choir was 1st runners-up in the previous edition of the competition held last year at the same venue. The HCFD choir members and church leaders with their trophies. Consolation prizes and certificates were awarded to each of the participating Choirs. Spirits were high and the excitement soaring even as the event drew to a close in the cold of the November evening, marking once again a special landmark in the unity and cultural diversity of the North-Easterners.